You’ve been in the industry going on 20 years now. What do you enjoy about working in economic development? What I like about it is impacting a community—whether it’s helping a business connect to another business or connecting people to jobs. I love helping communities grow, prosper and be successful. Looking back at your career, what makes you proud? Up until now, I’ve always worked in military communities, and any time you work with the military community and the men and women who serve our country, it’s very rewarding. For example, the creation of a hospital for our community back in Nebraska was a big win. When I look back, I’m confident I’ve left every community and organization better than when I arrived. On the flipside, I’m sure you’ve had your share of challenges and setbacks. Whether it’s feeding the steer or bush hogging, that’s the mentality. When I’m challenged, my first thought is, “Well, crud.” But usually it’s 30 seconds of that before I turn to, “It’s just gotta get done.” Let’s solve the problem or the issue. 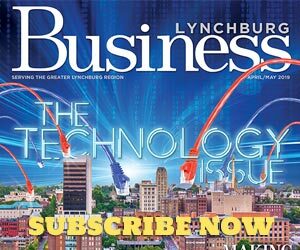 It’s been about a year and a half since the Lynchburg Regional Chamber of Commerce and Region 2000 Business and Economic Alliance merged to become the Lynchburg Regional Business Alliance. How have things gone so far from your point of view? Last year was about bringing two cultures and processes together, and we got through the year successfully. And now this year, we are continuing to smooth the edges and grow and move forward. It’s good… it’s really going well. What that solidifies and says to us and to the businesses that are members is we are an organization run on sound business standards and practices. We have financial policies and procedures, transparency, leadership etc. that’s at the top of the sphere. At a time when all of our money is precious, we want everyone to be confident that they’re engaged in an organization that has sound business principles. Another huge thing happening this year is the Alliance’s new building in the former James River Conference Center. The Lynchburg Regional Business Alliance is the premier economic development organization for the area. And make no mistake, we are a mid-sized metro area. We have incredible companies in this region—Moore and Giles, Glad, the Standard, and Genworth to name just a few—and the region’s primary business organization should reflect and represent those organizations and that includes being in a building that everyone is proud of. It is not just ours—it’s yours. We are also excited to be relocating to our thriving, urban downtown. It’s amazing what the city has done there. What is your vision for the Lynchburg area in the coming years? I would like for us to continue to be a forward-thinking, approachable community with an urbanized infrastructure… with a rural heart for the amazing, abundant resources that we have. Are there any pieces of advice or mantras you frequently use in your day-to-day decisions? Depends on the situation. In high school, I had an upperclassman say to me, “You have to learn how to take care of yourself, because you’re the only one that’s going to be there.” I also believe in other instances, “If you’re not at the table, you’re on the menu.” From an organizational standpoint, that’s something I often repeat to myself. And raised on a cattle ranch, I was always quick to spar with people. The expression, “Dig the ditch you want to die in” has come in handy for me. Learning how to pick my battles. I don’t believe in crutches or excuses, and I don’t think being a woman is a crutch. I believe people who work hard and are honest, truthful and of good character and integrity will be successful at business and in life. Going back to my upbringing, I was always taught that anything my brothers could do, I could do. It was never, “Well Megan, you should be in the kitchen making jelly.” It was, “You live here. You have a responsibility just like all of us… let’s get busy.” I just think that if you can do it and you’ve earned your stripes—male or female, black or white—it doesn’t matter to me as long as you’re good at what you do. Collaborative. Holistic. Hands on. I like the team approach. What’s life outside of work like for you? I like being with my husband, Tory, and my dog, Bruno. Also, anything outdoors like hiking and golf. And I’m an avid reader.